Andrew Carnegie was born in Dunfermline, Scotland on November 25, 1865. While growing up in Scotland Andrew did not attend school. However, his family encouraged him to read and learn. At the time, his father worked as a weaver. Then in 1848 his family moved to Allegheny, Pennsylvania. At the age of 13 Andrew went to work in a factory for $1.20 a week. Soon afterward he found a job for more money working as a telegraph messenger. In 1853, he was promoted to the position of telegraph operator. Andrew next took a job at the Pennsylvania Railroad where he worked as the assistant to Thomas Scott. While working for Scott, Andrew learned extensively about the world of business. Just 3 years later he was elevated to the position of superintendent. At this time, Carnegie began making investments, mostly in oil, and before long he was financially independent enough that he quit his job. Andrew soon focused on his other investments, especially the Keystone Bridge Company. The next decade Carnegie became solely focused on steel production. He hired the very best people in the business and used the very best technology. This business became the Carnegie Steel Company. Before long Carnegie revolutionized the steel production process by adopted the Bessemer method which was the first inexpensive process for mass producing steel. Not long after he began constructing steel manufacturing plants all over the United States. Carnegie owned every part of the process. He owned the railroads, the ships, the raw materials, as well as the coal fields. At the time coal was used to heat the steel furnaces. Carnegie maintained very competitive prices by working his men hard for very little money. By 1890, Carnegie was the largest steel corporation in the world. While Carnegie and his company made lots of money his workers were very unhappy. Then when Carnegie tried to pay them less the men at his Homestead, Pennsylvania plant stopped working and went out on strike. As a result, a very violent labor dispute erupted at his steel plant. Carnegie ended the conflict with the help of the state militia and Pinkerton detectives. In 1901, Carnegie sold his steel interests to J.P. Morgan's United Steel Company for over $200 million dollars, which was an enormous amount of money in those days. 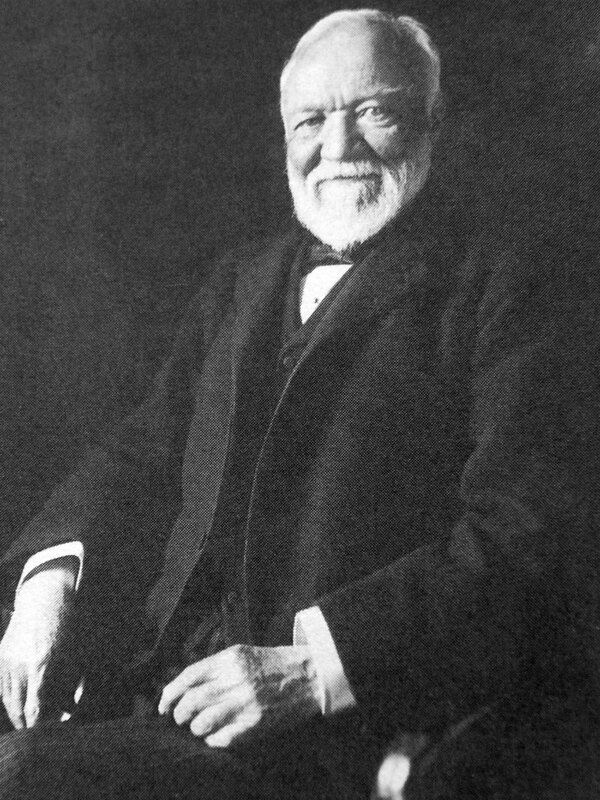 Carnegie was now one of the wealthiest men alive. Soon afterward he began to donate heavily to many causes. In 1901, he donated $5 million to the New York City Library so they could open up several branches. Carnegie would continue giving heavily towards library construction, building 2,800 additional libraries throughout the United States. He next opened what would become the Carnegie Mellon University, in Pittsburgh. Carnegie then opened the Carnegie Institute for teaching, and the Carnegie Endowment for International Peace. At the time, Carnegie was close friends with both Mark Twain and Theodore Roosevelt. At the same time he started writing and publishing books. In his 1889 book entitled “The Gospel of Wealth,” Carnegie said that it was the responsibility of the wealthy to use their assets to help others. He continued by stating that this was his formula for praiseworthy success in life. By the time of his death Carnegie had donated 90% of his riches, almost $350 million dollars. This would be almost $6 billion in today's money.